A well-designed menu should help diners choose what to eat while also highlighting the most profitable food items. When you're done with the design, the menu should represent your restaurant's branding as well as food quality, atmosphere and pricing. The first step in designing your menu requires pulling together a list of all items you plan to offer. This will help you decide how big the menu needs to be. If it looks like all of the items can fill more than one side of a 12-by-18 menu, break it into smaller menus so it becomes a more effective merchandising tool, suggests Dave Pavesic, Ph.D., in a paper for Georgia State University. For instance, offer separate lunch, dinner and kid's menus. To boost sales, Pavesic recommends putting desserts on a separate menu so diners don't give up an appetizer in favor of a dessert they see on the same menu. Restaurant-goers expect a menu to follow a basic format. Put the logo and name at the top of a single page menu or on the front cover if you use a two-page or folded menu. The back side can tell your unique story, the restaurant hours or point out special offers. Break menu items into sections, such as appetizers followed by a section featuring main entrees and putting desserts and drinks at the end. Instead of listing entrees from the lowest to highest priced, shuffle the order so it's more difficult for diners to scan for the lowest priced item. Put your moneymaking food at the top of the list or in each category since diners are most likely to choose the first item, says research analyst Theresa Kim in a 2014 article for U.S. News Money. Don't add dollar signs in front of the prices, as diners spend about 8 percent more when they don't see those. That was the result of a Sybil Yang and Sheryl E. Kimes 2009 Cornell study published in the International Journal of Hospitality Management. Tantalizing descriptions sell more, says Kim, so paint a visual picture of the food item to entice patrons to order. For example, "Made from sirloin beef with crisp lettuce, ripe tomato, sauteed mushrooms and our popular house sauce" sounds better than a plain old cheeseburger. The Huddle House, a chain of restaurants in multiple states, changed their menu to describe an omelet and orange juice to "light and fluffy omelet" and gave the brand of orange juice, says writer Sarah Kershaw in 2009 article in the New York Times. The menu color helps patrons understand the atmosphere. For instance, an elegant restaurant with a dress code wants a menu printed on beige, thick paper. A family restaurant that provides kids' activities would use a brightly colored paper to show a fun atmosphere. Add graphics when appropriate, such as to highlight signature items or the children's menus. You can also use graphics to depict the food. Use blocks of color or a border to highlight certain items, such as appetizers or other money-makers patrons may miss because they're focused on the entrees. Use a large bold font –– 14 or 12-point works well –– for the name of the item followed by a description that uses a 12 or 10-point font. 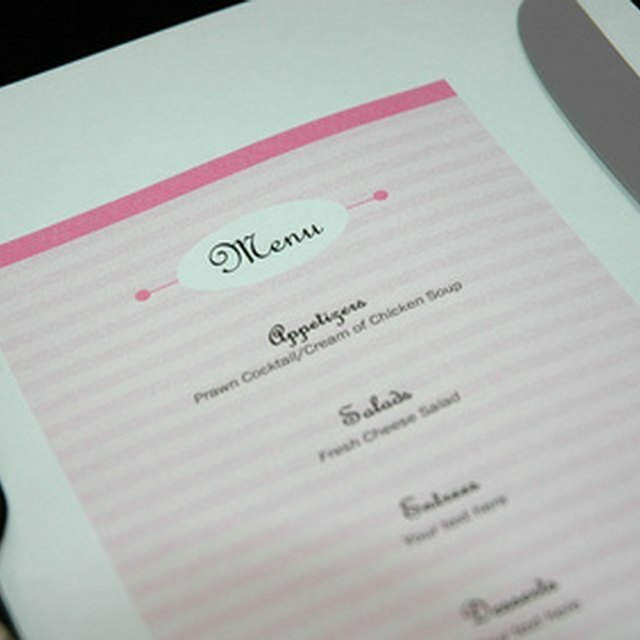 Avoid using smaller fonts to fit everything on the menu, as it will just look crowded and make it difficult to order. List the menu items with high profit margins in contrasting, bold fonts. For instance, if your menu is pale green, use a bold deep purple, dark blue or dark green font to highlight items you want people to order. Menu templates from companies such as The Webstaurant Store and Canva are available if you don't want to design one from scratch.